What you eat, how much you exercise, and your stress levels can have a huge impact on the efficiency of your digestive tract. Poor digestion leads to disease. Choosing mostly fresh, unprocessed food, chewing thoroughly, getting enough exercise, and dealing with your stress constructively makes it easier for your body to digest meals and absorb nutrients, and these choices can also help you achieve a healthy body weight, another factor of good digestive health. Drinking plenty of water and getting enough Omega fatty acids is part of the nutrition-side of healthy digestion. If you are taking an antibiotic, you should also take a spread of probiotics. It is also not a bad idea to take a probiotic occasionally throughout the year preemptively. The article below goes into detail on how diet, exercise and stress management contribute to digestive health. You already know that a balanced diet and regular exercise are the keys to good health. But did you know that these lifestyle habits can also help regulate your digestive tract? Good digestive health truly depends on how well you take care of yourself overall. Not surprisingly, what you eat makes a huge difference in how efficiently your digestive tract works. "People eat a lot of junk — highly processed food with preservatives — which contributes significantly to mal-digestion and irritable bowel," explains Francisco J. Marrero, MD, a gastroenterologist with the Digestive Disease Institute at the Cleveland Clinic. Relying on vending machine fare, junk foods, and fast foods instead of fresh fruits, vegetables, and whole grains gets many of us into trouble. "People have fallen away from the very healthy, well-balanced, home-cooked meal. In general, people need to take stock of what they're putting in their bodies," notes Dr. Marrero. Eat plenty of fiber; think fruit, vegetables, and whole grains. Eat three to five servings of fish each week. Choose lean cuts of meat and remove the skin from poultry. Stay well-hydrated — water is best. Avoid high-fat, processed, and fried foods. Eating the right foods not only makes it easier for your body to digest meals and absorb nutrients, but it can also help you achieve a healthy body weight, another essential for good digestive tract health. "People who maintain a healthy weight and exercise and keep themselves busy with constructive things have less trouble with their bowels," says Marrero. Obesity, he notes, is linked to a number of digestive problems such as gastroesophageal reflux disease (GERD), hemorrhoids, and even esophageal cancer. "Losing weight or maintaining a healthy weight can prevent a lot of problems from happening down the road," Marrero adds. Getting regular exercise can keep your digestive tract healthy by warding off constipation and other problems such as weight gain and stress. Be sure to engage in at least 30 minutes of physical activity most days of the week. Avoiding tobacco and minimizing your alcohol intake are also important for keeping your digestive tract running smoothly. "Smoking is so devastating to just about every system in your body," says Marrero. Protect your digestive tract by quitting smoking and avoiding secondhand smoke, since tobacco exposure has been linked to many conditions including heartburn, indigestion, esophageal cancer, pancreatic cancer, and colon cancer. Stress can also play a big role in how well your digestive tract functions. "People should always find constructive ways to deal with their stress — having close family relationships, people to talk to, and things to do that are healthy and creative," Marrero notes. Keeping stressful situations in perspective and maintaining positive outlets for stress relief is probably some of the best advice anybody can follow to protect both their digestive tract and overall health, Marrero says. Our optimal blood pH is somewhere around 7.4, where 0 is Acidic and 14 is Alkaline. Acid is created in our bodies through natural bodily processes. However, when we eat acidic foods, are stressed, lack sleep, and/or neglect to exercise, our bodies can become excessively acidic. An acidic environment in our bodies leads to inflammation and disease such as cancer, heart disease, fibromyalgia, and chronic fatigue. To buffer the acids in our blood, our body uses alkaline minerals, but if our diet (acidic foods) or lifestyle (not getting enough sleep, neglecting to exercise) is on the acidic side, then these alkaline minerals cannot effectively reduce the acidity in the body. There is a school of thought that one of the main ways we can help to maintain an optimal pH in our bodies is by eating an alkaline diet. 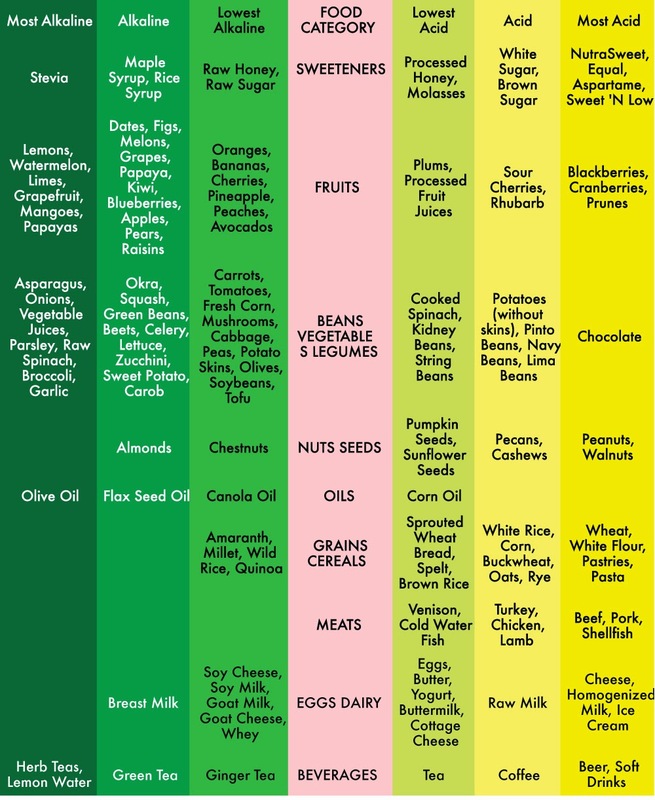 Certain foods are more acidic and certain foods are more alkaline, and by eating more alkaline foods we can assist our body in creating that optimal pH. The most effective diet for maintaining a healthy pH is one where you eat about 75-80% alkaline foods and only 20-25% acidic foods. It can be difficult to ascertain which foods are acidic and which are alkaline by just guessing because, for example, although you would maybe guess than lemons are very acidic, in our bodies they have an alkaline effect. Almonds are Alkaline and this recipe combines almonds with fresh herbs for an amazing, aromatic recipe. 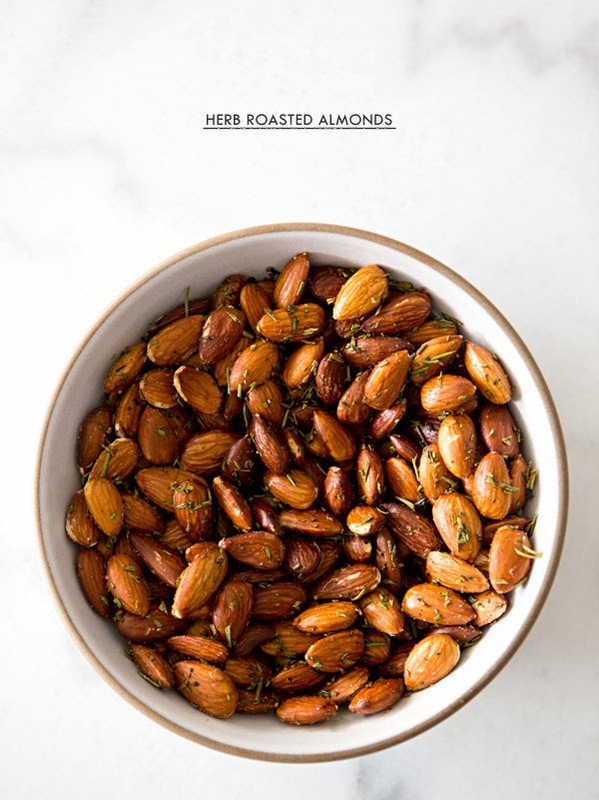 These almonds would be perfect for holiday food platters or as a holiday food gift, too!